Today's forecast includes an update to the Scottish swing mechanism to reflect a recent ICM poll which has the Conservatives on 25% north of the border, contrary to earlier polls placing them on around 30% across Scotland. 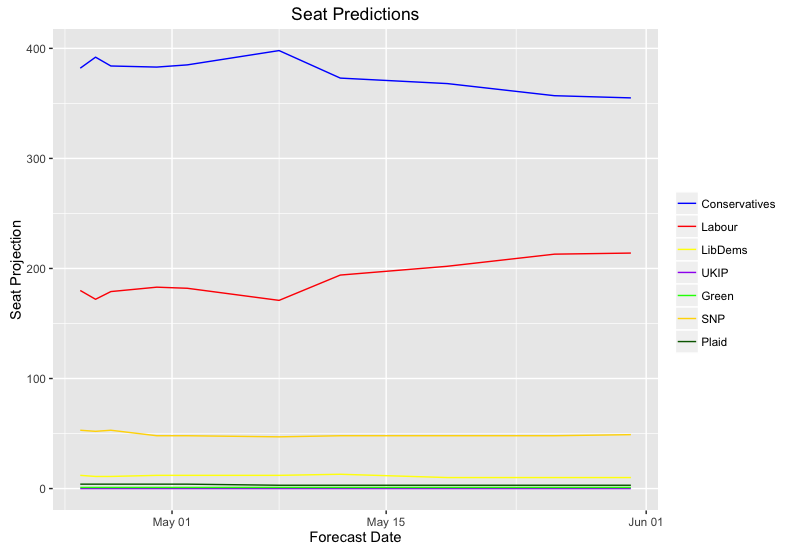 This week, YouGov released their forecast model, the central projection for which was a 'hung parliament'. Firstly, credit to YouGov for being bold. It always benefits the field when different approaches are tried, and when there is genuine diversity in methods and projections. Succeed or fail, this will only further our knowledge and accuracy in predicting elections. 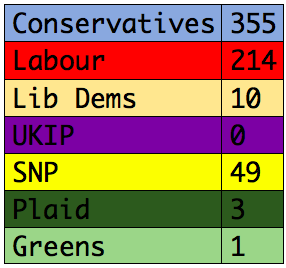 While the hung parliament prediction obviously raised eyebrows, even a simple Uniform Swing (UNS) model using their most recent poll (31st May) which has the Conservatives just 3 points ahead (Con swing +3, Lab swing +9), would indeed lead to no overall majority result: Conservatives on 314, and Labour on 256. The 5 day rolling average UNS model used as the basis of this forecast includes this YouGov poll and others dating back to May 26th. 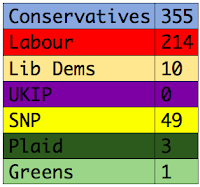 It produces the following result: Conservatives (341), Labour (227), Lib Dems (5), UKIP (0), SNP (55), Plaid (3), and Greens (1). The 'polls plus' model, which combines a range of contextual and electoral information into the forecast, estimated a Conservative majority of 60, having gained 24 seats. This result continues the trend of falling Conservative seat total projections in this forecast, which is visualised in the tracker graph below. The PME Politics forecast continues to sit in between the majority of academic forecasts (which still mostly project a majority of around 100), and the YouGov model. The fall in the projected Conservative share in Scotland (according to a new ICM poll) brings them down to 5 Scottish seats, with Angus Roberston in Moray now looking safe. 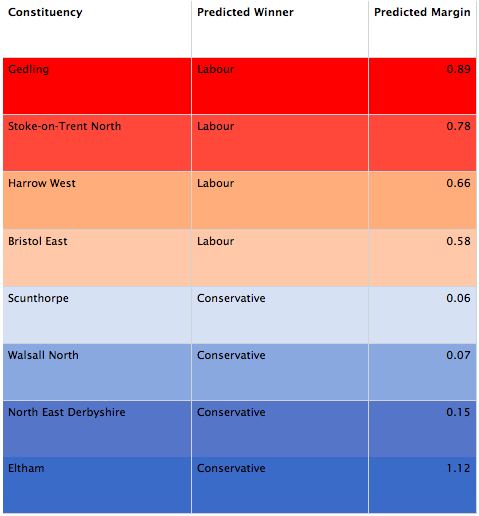 The Con-Lab marginals line has shifted only slightly, with the model estimating that Labour will hang on in Bristol East, while the Conservatives take Scunthorpe.